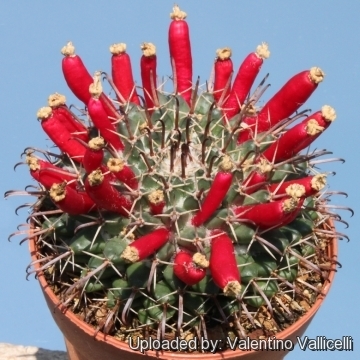 Accepted Scientific Name: Mammillaria uncinata Zucc. ex Pfeiff. Enum. Diagn. Cact. 34. 1837 Pfeiff. Habitat: Grows at 1.500 - 2.800 m in altitude. 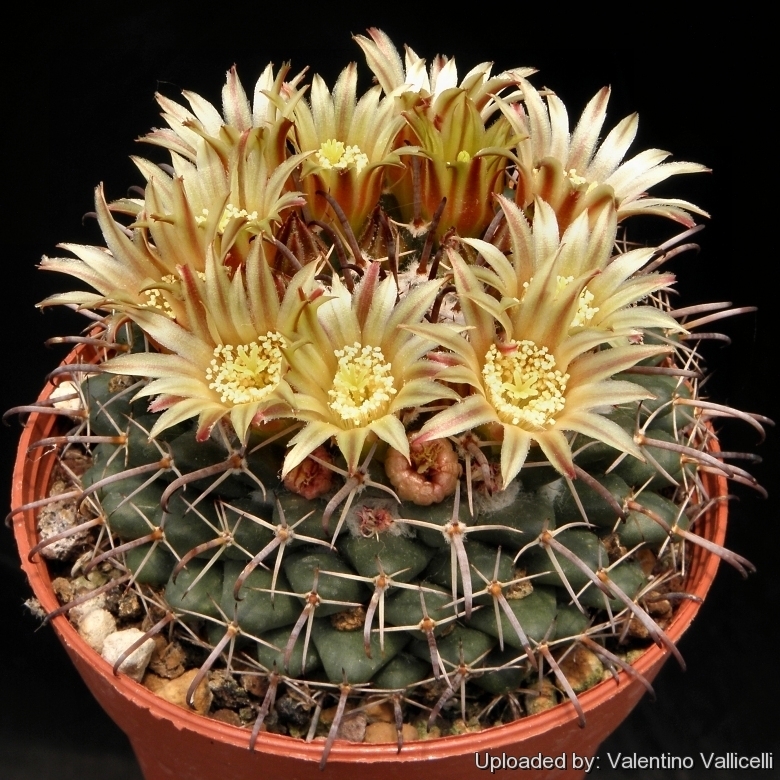 Mammillaria uncinata Zucc. ex Pfeiff. Cactus depressus Kuntze non DC. 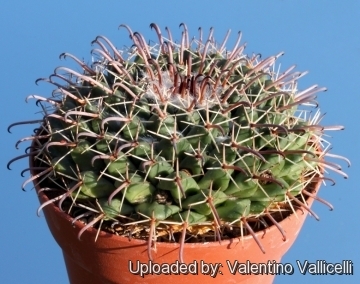 Mammillaria uncinata var. bihamata (Pfeiff.) Backeb. 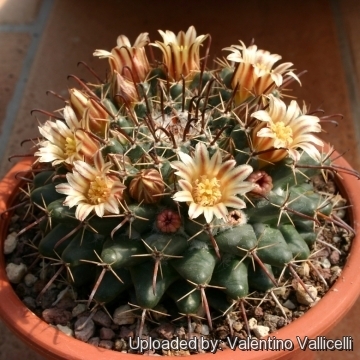 Mammillaria uncinata var. biuncinata Lem. 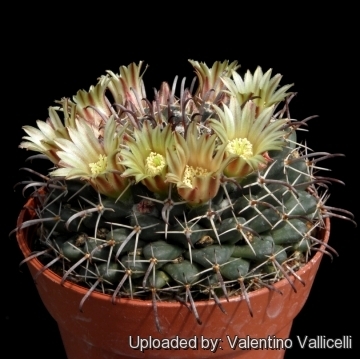 Mammillaria uncinata var. rhodantha A.Dietr. 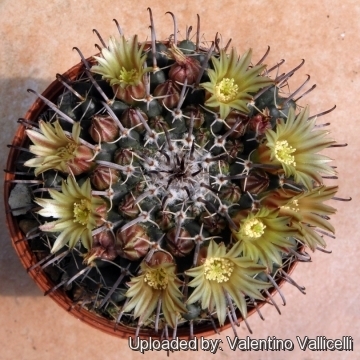 Mammillaria uncinata var. spinosior Lem. 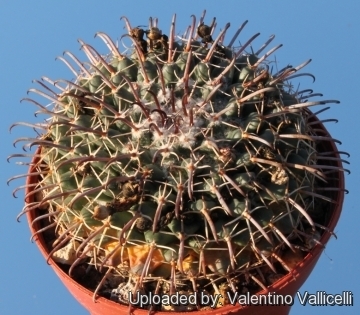 Description: Solitary or slowly offsetting cactus. Stems: Dark blue-green, 6 - 10 cm high, 8 - 10 cm in diameter. 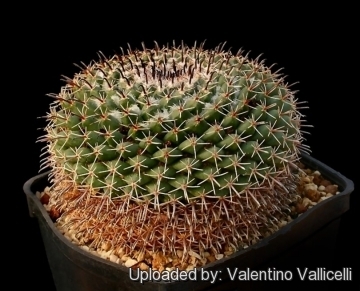 In the wild it grows very flat, but under cultivation it grows as globular as any other. Radial spines: 3 - 6, upper ones shorter and stronger, straight or slightly curved, pinkish to greyish white, 5 - 6 mm in length. Central spines: 1, hooked, pinkish grey to dark purplish brown, with dark tips, up to 10 mm long. Flowers: Funnel-form, yellowish or creamy white, with brownish mid-veins, 15 - 20 mm long, up to 15 mm in diameter, in spring and summer. Fruits: Cylindrical to club shaped, purplish red to red, 15-18 mm long in summer. Cultivation and Propagation: It is a rapidly growing species . Water regularly in summer, but do not over-water (rot prone). 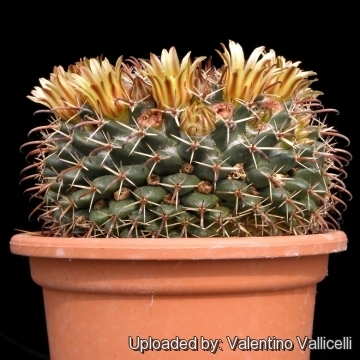 Use pot with good drainage and a very porous potting media. Keep dry in winter. Feed with a high potassium fertilizer in summer. It is quite frost resistant if kept dry, hardy as low as -5° C (some reports give it hardy to -12°C). Outside full sun or afternoon shade, inside it needs bright light, and some direct sun. Easily clustering and easily flowered. Most plants will offset readily, and clumps can be produced in a very few years. Propagation: : Direct sow after last frost.